← What was GM thinking? This entry was posted in Design and tagged Cranberries, Cranberry sauce, Thanksgiving. Bookmark the permalink. Woo! You just settled a debate (not really a debate – more a mystery) on Facebook. So thanks! Who buys canned cranberries anyway? This guy. 🙂 And apparently a whole host of other crazy people in the US. At least for me, it has a warm place in my heart every Thanksgiving. I have been looking for the answer to this “mystery” for 4 years. 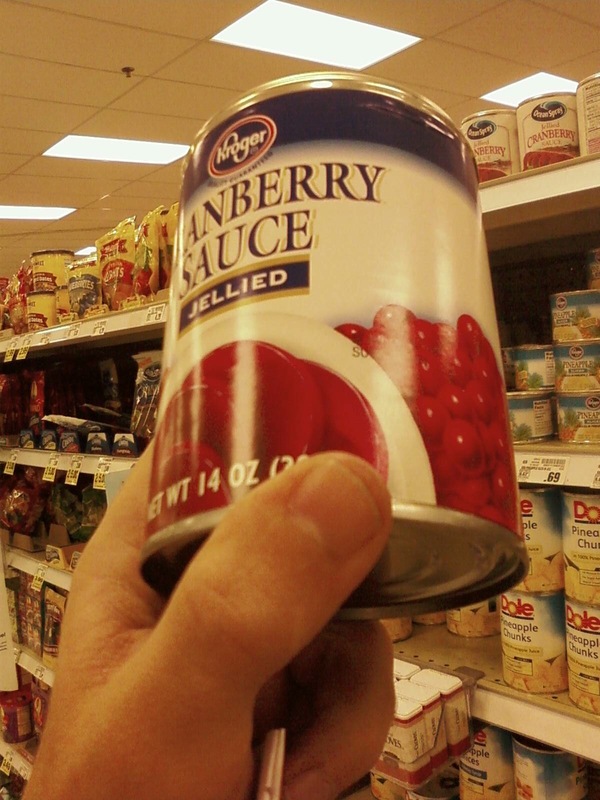 I’ve opened and emptied many cans of both types of sauce – jellied and whole berry – and found that the contents are consistently jelled to a degree which will maintain the sauces’ physical structure no matter how you open the can – top, bottom or middle. The only difference is when opened conventionally the lip end will sit somewhat flatter on its’ end. Now this is a very minor advantage considering that no-one ever serves it in that manner. So while I respect your opinion as being the most reasonable of any answer I’ve yet found, I’m still not convinced it is truly valid. I’ve been told by an informant that can labels in Australia are affixed in the normal manner, but their toilets flush clockwise too so they might not count. Or they just might not care how their cranberry sauce comes out of the can. Having just opened yet another can of cranberry sauce for no other reason than to try to understand this dilemma, I think I have the real answer. I alone have bought and opened at least 20 cans of cranberry sauce for no other reason than to figure out why this is done. I have 11 more cans in my food pantry. I don’t even like the stuff anymore. It’s MARKETING !!! Somebody came up with this idea years ago to sell more cranberry sauce. I gotta go make more cranberry/jello stuff. Again…. I see you removed my comments. Pretty lame. Thanks Rick for you insight and comments. All comments on this blog have to be validated – and it just took a bit of time to do that. I love comments, even if they disagree with me – because it shows discussion. Thanks Rick again. Now they’re back on. Never mind. Don’t know how that happened. Might have something to do with being on Safe Mode this time. Old computer is barely working now. Sorry. Good insight Cran. I’m super glad you gave us a bit of your mind-share on this deep subject. After all, “Cranberry Lives Matter”. Hi Jason. I just spent three hours typing on a response to your site. Put in my name and email address and pressed post comment. Got ” Error. Enter valid email address ” and my reply disappeared. Please PLEASE tell me you got it or can retrieve it from wherever it went. Oh no! I just saw this today Rick – and I looked through the logs and comments, and could not find any trace of your three hour response. Major lame sauce! (which is a distant, rude cousin to Cranberry Sauce). May I suggest in the future, that before you hit post/submit/enter, that you always Ctrl+C (Edit->Copy) your text in the 1-5% chance that this happens ever again. This is has happened to me too many times – and I make it a habit to do just that. Then you can post it in a Notepad or TextEdit or Browser window … sorry Rick!